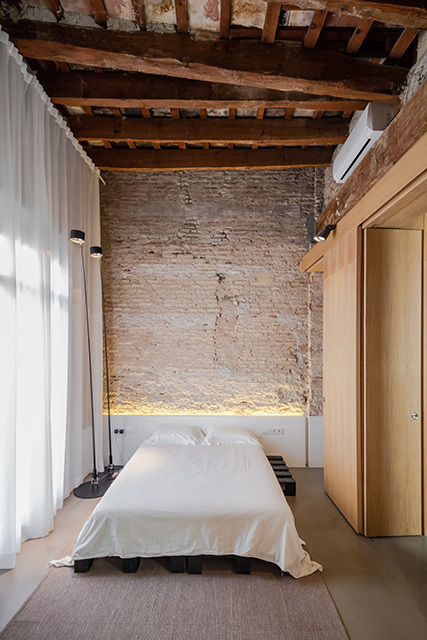 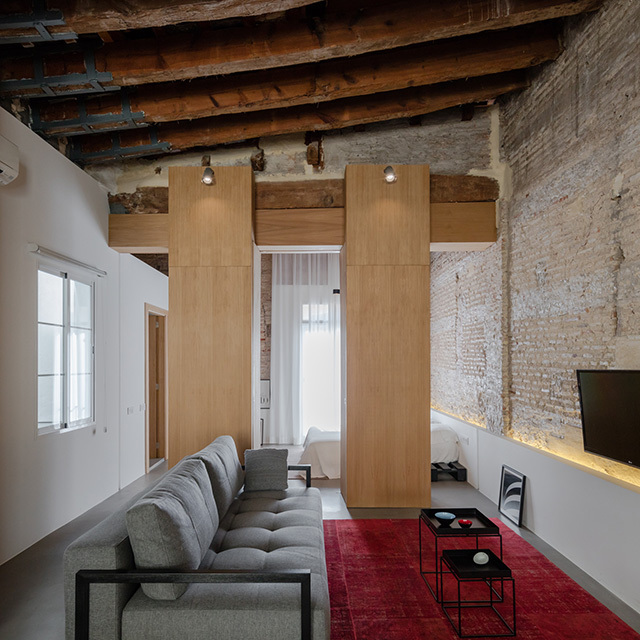 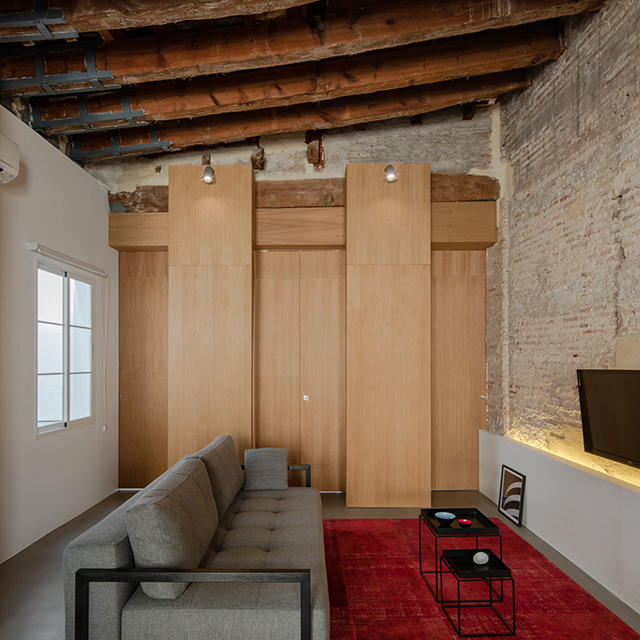 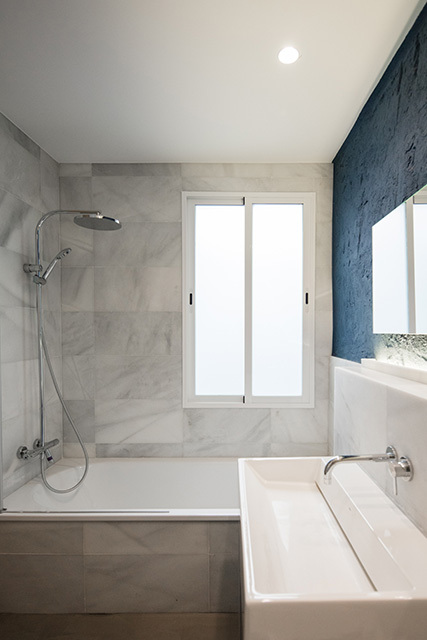 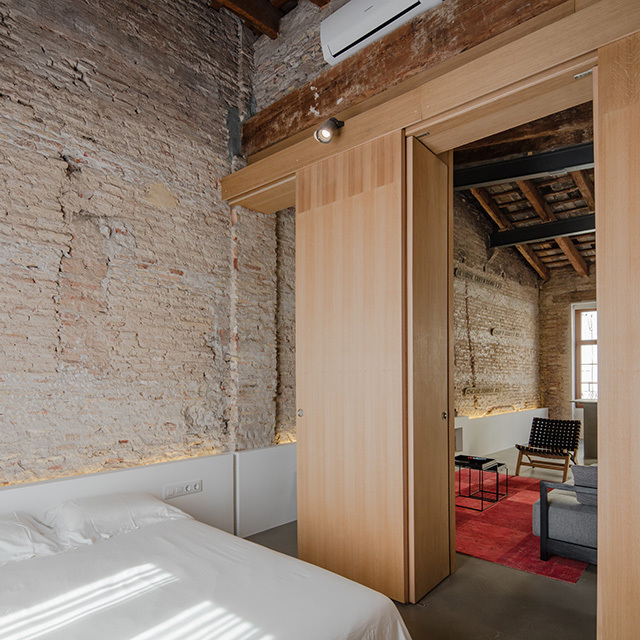 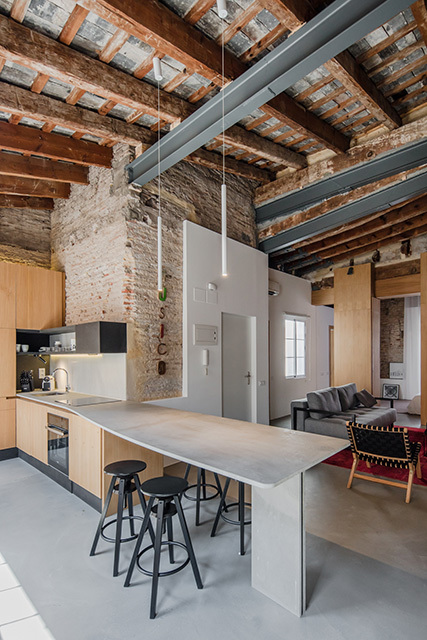 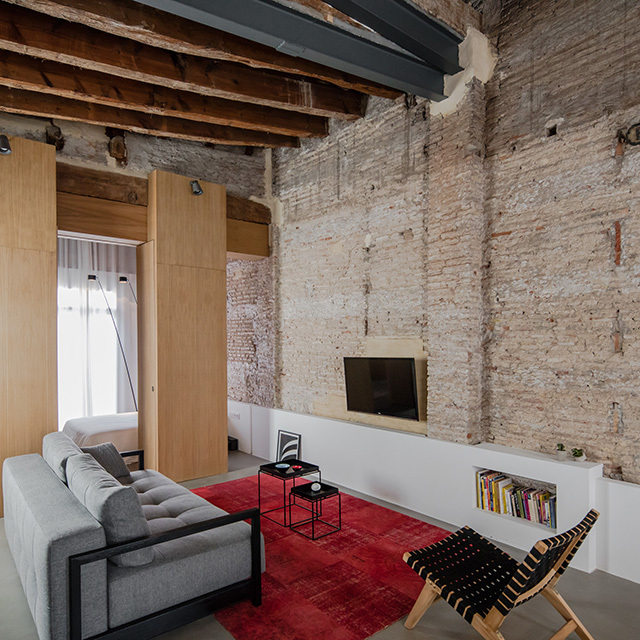 In 2017, the London based architecture and design practice Roberto Di Donato Architecture completed the challenging renovation of an apartment unit located in an early 20th century listed building in the heart of Valencia, Spain. 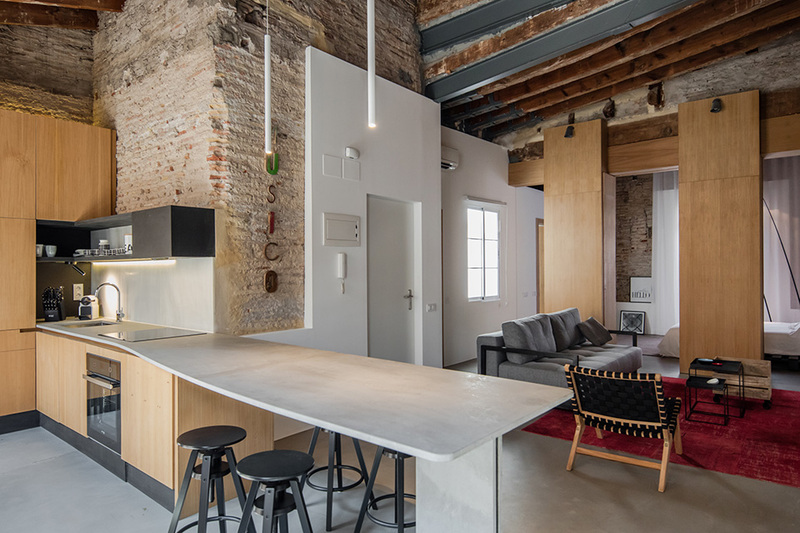 After many years in state of abandon, the apartment was an empty shell when it was bought by the client, creating numerous opportunities but also challenges to the design team. 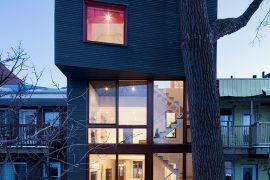 The approach to the project was guided by the ambition to create distinct, yet fluid, modern living spaces almost leaving undisturbed the existing structure. 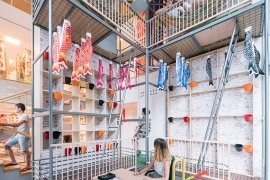 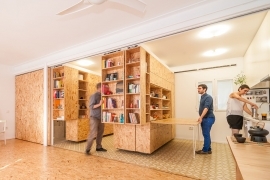 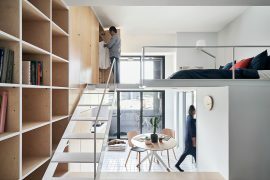 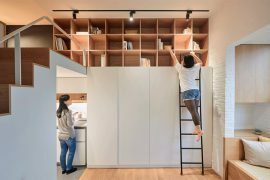 ‘We opted to introduce non-conventional partition walls,’ the architects said, ‘making the entire depth of the space visible and interconnected.’ The space is constantly flowing from one area to the other, with the separation between night and day areas provided by two tall wooden elements. 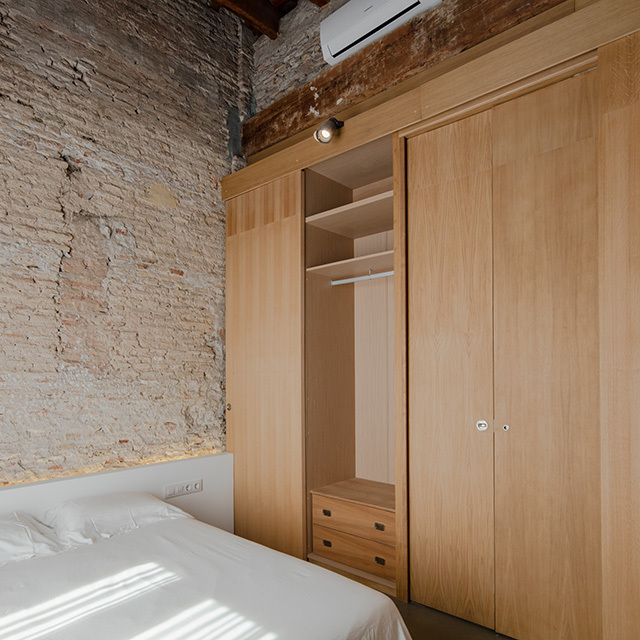 These custom designed elements also contain the bedroom wardrobes and three sets of doors allowing varying degrees of privacy. 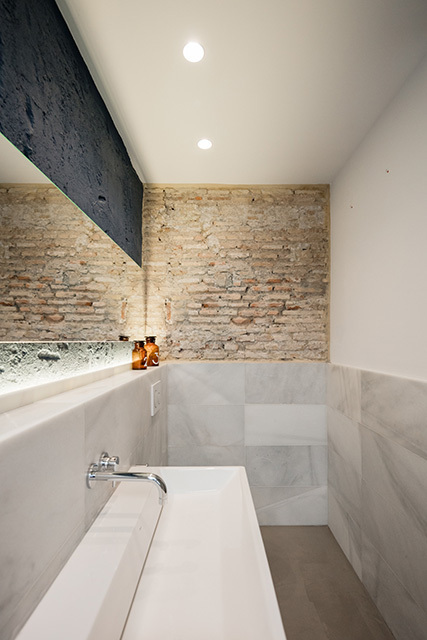 The ceiling height was also deemed a particularly valuable element in the renovation. 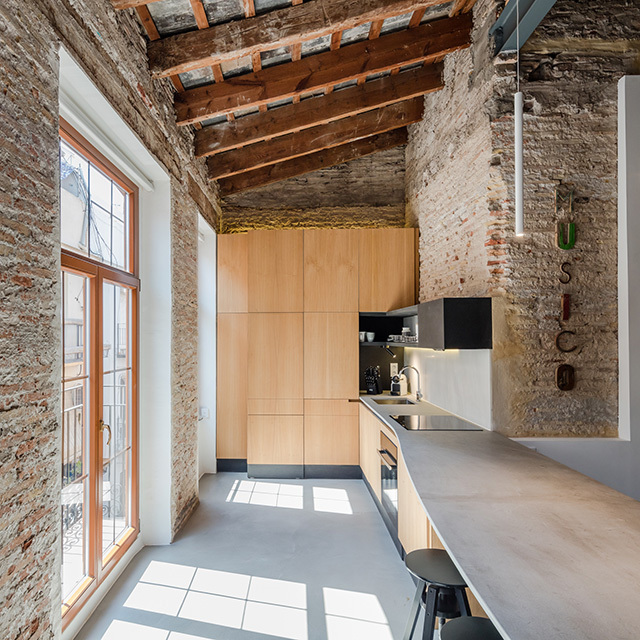 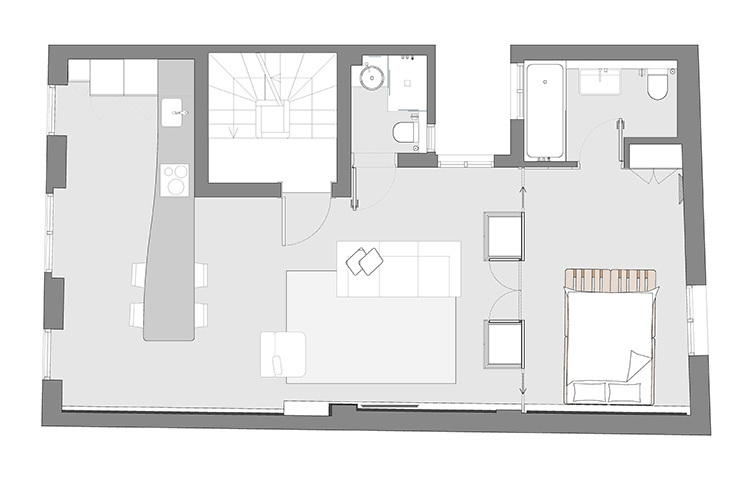 The structure of the roof was restored and kept fully exposed, no element of the new design gets in contact with it, underlining the respect for the past and also enabling the full sense of space and volume of the apartment to be perceived. 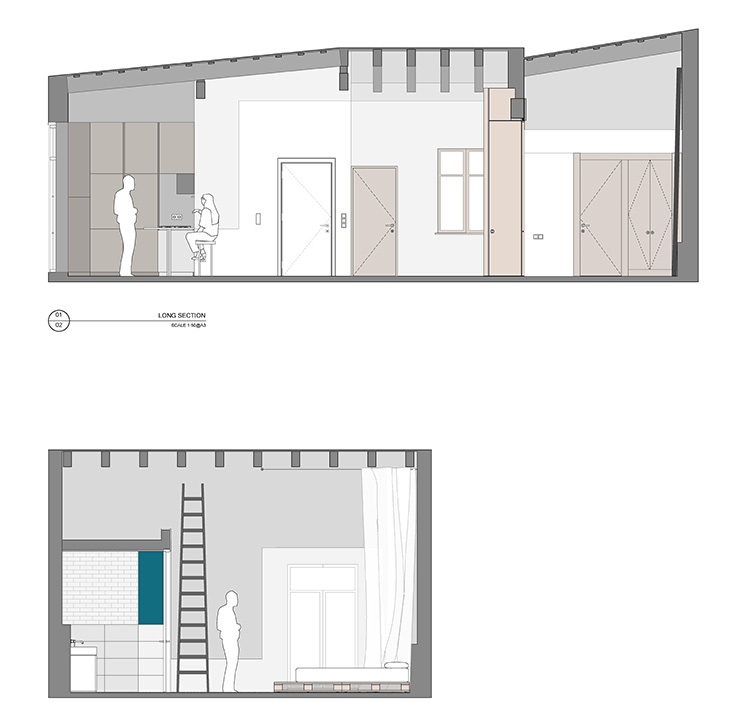 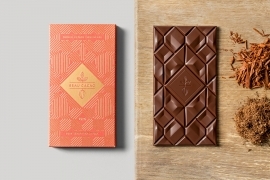 One more tool utilized to emphasize the special quality is the direction of the design elements. 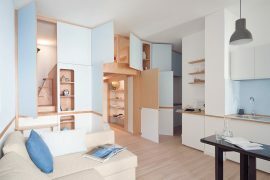 All the new construction elements have been introduced with a strong and clear direction in space. 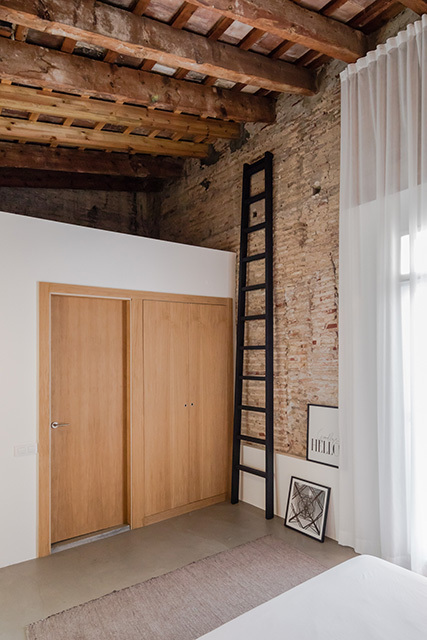 The wooden wardrobes, the full-height white curtains, and the tall ladder are accentuating the verticality of the space. 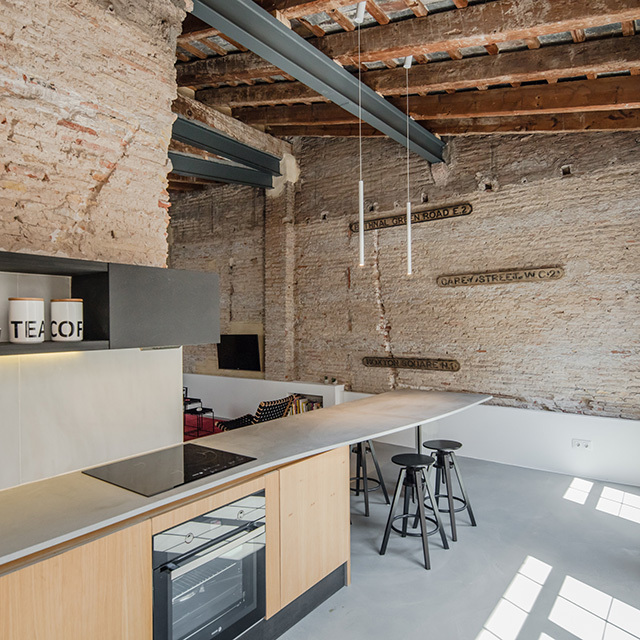 In turn, the long kitchen worktop, the white plasterboard pedestal and its line of light are enhancing the horizontal dimension. 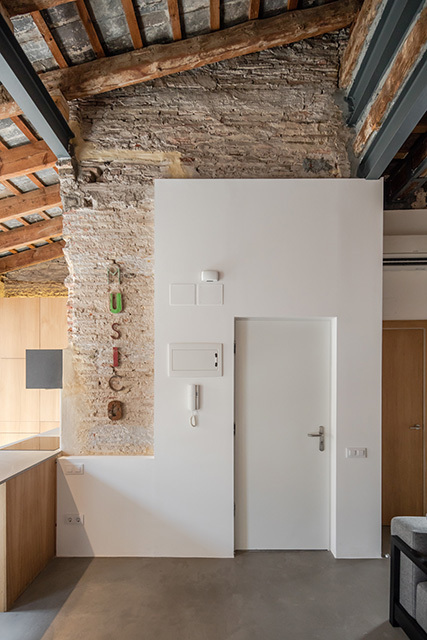 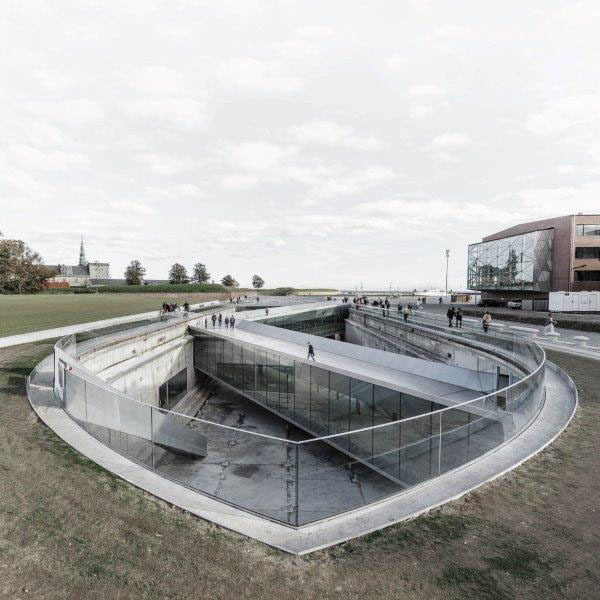 With a reduced space, brief and budget, the project succeeded in introducing a contemporary design language, while enhancing the character and the materiality of the old space. 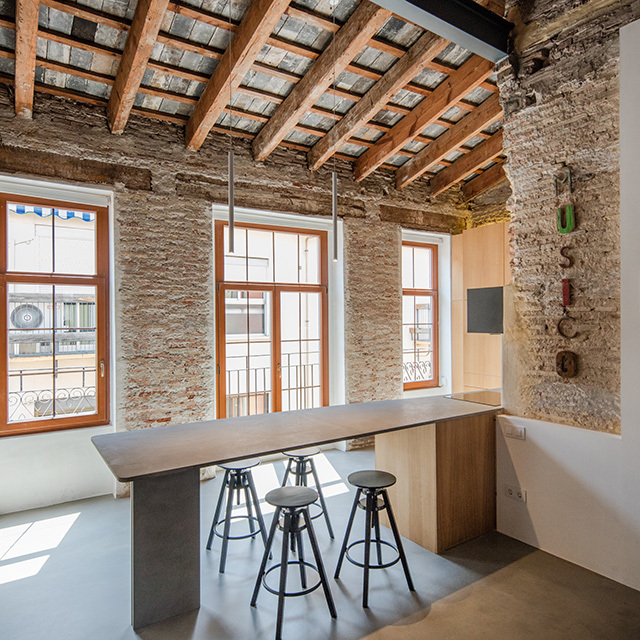 By only adding essential new features, wounds and layers of transformations over the years were carefully retained and displayed to enhance the sense of continuity with the building’s history.